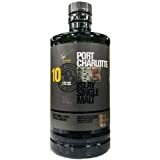 Bruichladdich 11 Year Old 2006 vintage Islay single malt Scotch whisky. Single burgundy cask #14006-14 bottled October 2018. 306 bottles for the UK Market.